I don't pretend to be Condi in terms of being a Russia expert. I am studying the language and have spent a fair amount of time reading Russian history and studying Russian culture. But I am such an expert that I didn't know about Anna Politkovskaya until she was brutally shot down last week. Now after reading about her bravery, I feel compelled to honor a sister warrior. Ms. Politkovskaya was born in the United States to diplomat parents. She returned to the Soviet Union to study. She became a journalist and had published several books very critical of Putin. Ms. Politkovskaya was writing for Novaya Gazeta, a biweekly paper in Moscow, at the time of her murder. 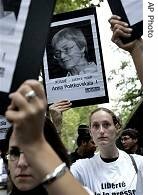 Anna Politkovskaya knew what she was doing in Putin's Russia. She was writing almost exclusively about the war in Chechnya and documenting the torture suffered by ordinary citizens at the hands of the Kremlin sponsored government. She was so highly regarded for telling the truth, when the Chechens took over the school in Beslan, she had been requested to return to Chechnya to help negotiate the standoff. There was apparently an attempt on her life during her trip to Beslan when she became unconscious after drinking tea. She was violently ill from this episode and never made it to Beslan. The Russians eventually killed 125 hostages and all the Chechens by storming the school. Reading other accounts of her bravery and committment to fairness while poking her finger in the eye of the Kremlin makes me incredibly sad that we have lost such a warrior. Her seriousness is not just her frown, her severe glasses and full head of grey hair. It's the tension, anger and impatience in her whole body, making clear that her sense of the continual injustice being perpetrated in her homeland never leaves her, that she can't shut it out in a way almost all British journalists, even the campaigning, radical kind, can. "To this day there's torture in any FSB branch in Chechnya, like the so-called 'telephone', where they pass an electric current through a person's body. I've seen hundreds of people who've been through this torture. Some have been tortured in such an intricate way that it's hard for me to believe that it was done by people who went to the same sort of schools that I did, who read the same textbooks." No wonder Bush is best friends with Putin. They both like to torture people. Anna Politskavaya apparently was doing a wonderful job for a small newspaper with limited readership in country that covers 11 time zones. She had pissed off the Kremlin/Putin, the Kremlin back thug boss of Chechnya, Kadyrov, the security forces in Russia to name a few. She was unrelenting in her critcism of Putin and has called him out for use of Bush's war on terror. Putin has tried his own smoke screen, linking his invasion of Chechnya to the global war on terror. Any wonder the results are the same? Rebellion, home made terrorists, torture and lies. And if there are any questions about Putin's heavy hand, there have been 21 murders of journalists in Russia since Putin took office. I think I am hearing Janis Joplin "Freedom's just another word for nothing left to lose." Rest in peace, hermana. You served the world well. I have seen no sign of that bravery yet. But we can always hope.